"Safar Badnamah . . . (Season1, episode 2)"
While I was returning from my late, late, late evening class at night I notived the cameras around and what good they were of to the society . . . I walked and walked and before I could stop and wait, the bus was almost already. Alas! I felt so revived and elated for being blessed with immediate transport. The bus went past the underpass then a spot where there were green and white lights . . . *weird* I thought. We don't have electricity in our homes but these lights being put up are still on during the day time. And what's more annoying is the songs being played in this holy month, they are not 'Naat' or 'Nasheed' as most would call . . . unfortunately they are disco songs and people can't help keep the volume to their ears only. So quite a number of us get to avail a chance in Muharram and Rabbi-ul-Awwal to just blare away rather than actually praying a little extra. Anyway, I tend to deviate from the topic I'm discussing . . . well . . . as the bus went a little further, a woman came in. She carried with her some food stuff, something that looked like maybe left over dinner. One of the things disappointing about her was that she placed it near her feet . . . Respect for food? None. Another woman's suggestion of picking it and keeping it somewhere on top fell on deaf ears. Within seconds she revealed herself that could not stop us from laughing. She kept on talking and talking and initially kept on bragging away that she got into the wrong bus and then that doesn't really matter to her because it doesn't cost her anything. The bus conductor came to collect the fare from her at which she uttered, "How dare you ask for it? Don't you know who I am?!!!!!!!!! You want to continue with your job?" Such moments make it difficult at to suppress your laughter. "Don't you know who she is? She is a 'Madam' . . . Madam in police", the driver told the conductor. "Please give us your card so that we also get to save our share of the fare", that other woman in the bus said. Well, now this crazy woman was not only cray but awfully crazy for her next sentence proved the level of her craziness. "We are 'Saith' (owners), you people are passengers . . . When we start counting our buses in the morning, the night takes over and we still can't stop counting them . . . " She also told the laughing us that when she, the mentioned 'Saith Loug' go to petrol pumps, they are not even asked to pay for petrol or diesel. Apart from the fact that this evil looking woman seemed to be on drugs, she also seemed stupid that contributed to her over all obnoxious nature. She was hyper . . . I'm sure she didn't have had Red Bull otherwise she would have been flying. The reason I am talking so negatively about her is that women like her find ways not to pay the bus fare and are actually pick pockets, the way they aim at bags and pocket is a totally different story and I will be discussing some time later. We should be careful of such beings while traveling in public buses, they come equipped with all forms of indecency. Even maids are poor, they also travel by public buses, they might fight for a Re less or a Re more but would carry themselves with sufficient self respect and pay their share. Thankfully this weird thing got off at Cantt Station and a smooth and yet not funny journey prevailed. 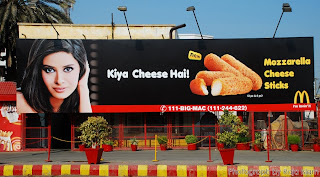 We moved on and then again I chanced upon that Mc Donald's billboard that said 'Kiya Cheese Hai' fit in between the model and the cheese sticks. When you look at the model and say that these not so catchy lines are indecent the people for this advertisement would aim for an attack on your mind, may be your perverted mind, the way you think etcetera, etcetera. However, this cheap style was their way to approach the mass audience . . . Might work . . . So there are two annoying things at Allah Wala, the colour of this fountain itself and Mc Donald's cheesy poster. "Kiya Cheese Hai ??? Mozzarella cheese hai . . . The answer is right there in the question . . . Comprehension.